Based on helping the natural development of the human being. Children teach themselves using materials specially prepared for that purpose. Understanding comes through the child’s own experiences via the materials and the promotion of children’s ability to find things out for themselves. The teacher works in collaboration with the children. The child’s individual development brings its own reward and therefore motivation. Children learn from a set curriculum according to a time frame that is the same for everyone. Motivation is achieved by a system of rewards and punishments. 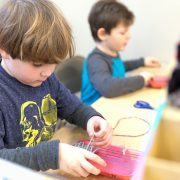 © This material and any portion thereof may not be reproduced for any purpose, whether private or public, without the expressed written permission of the Association Montessori International / USA.